It goes without saying that communication is an integral part of every company. A smooth communication process can yield great benefits. Despite the proliferation of new communication platforms, email is still one of the most powerful tools when it comes to communication, be it businesses or individuals. People send emails all the time. Used the right way, email can help you capture more leads, nurture them, close more deals and increase overall efficiency within your company. The question is: how can you get the most out of your email marketing campaigns? First, navigate to Templates and on the drop-down menu click Email templates. As you can see in the form below, in Flexie there are two types of emails templates you can choose from: template email and list email. Before we explain how can you create an email template, let’s explain the difference between the two. A template email is automatically sent by workflows, forms, etc. Notice that a template email can be edited, but you cannot send it to an entity list. A list email, on the other hand, can be manually sent to selected entity lists. Entities can be leads, contacts, deals, accounts, cases and custom entities. Furthermore, once you send a list email, you cannot edit it. You can, however, send it to a new entity as it is added to the an associated list. Before you choose the type of email you want to send, make sure to choose the entity you want to use your template for. Now, let’s explain how can you create an email template. Let’s suppose you want to create a template you want to send to a lead or group of leads. Go to System Entities and choose Lead. Next, go to New List Email and click Select. Choose a subject for the email template. Next, fill in the body of the email. Here, you can choose the style, the font, the size of the writing, etc. Then you can use the Email Builder to customize your email’s HTML, or you can write your own plain text version. As you can see here, you can write the name of the person sending the email(From name), the email address of the sender(From address), the email address you want to reply to(Reply to address) and another email address you want to send your email to(BCC address). You can also attach files to your email. Next, go to the right side of the screen and fill in the fields. 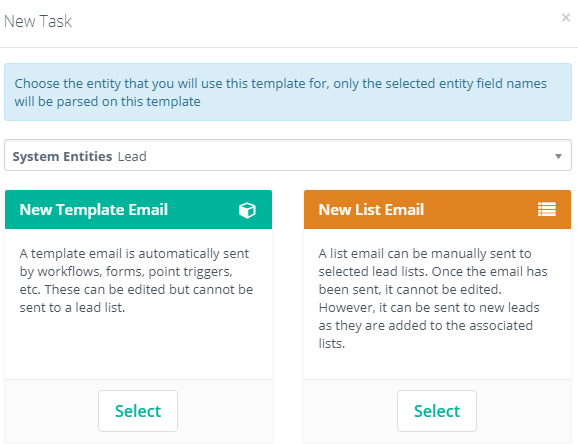 Give the email a name, choose the entity list you want to send the email to(a lead list in our case) and you can also choose a category if you want to. Once you make sure the information entered is correct, click Save & Close. The great thing about email templates in Flexie is field parsing. That is, you can create personalized email templates by parsing fields. For example, if you want to send an email that begins with the greeting: “Hello (enter name)” to a lead, you can get the name by parsing it through its alias value(first_name). Since each lead has a unique id, once you parse it in the body of the message, the lead will read the greeting as: “Hello (insert a name)”. To make sure the parsing is correct, you can send an example to your email address. To do this, first click on Templates -> Email Templates. Next, click on the email template you’ve just created and then click Send Example on the upper-right corner of the screen. This way you see for yourself how the email looks like. Moreover, you can combine parsing methods and use if/else conditions to further customize your email template.